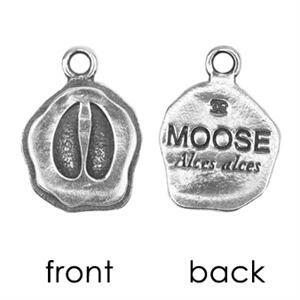 ES-ATNA08 - Moose Animal Tracks Pendant. 1"x.75". Animal Tracks features pendants inspired by the tracks left by a variety of North American Animals. The fronts ofth ependants have the particular animal track, and the backs have the animal name as well as Latin designation. Each pencant comes on a 32" piece of natural deer-skin. Each comes with a display card that tells specifically about this particular animal. EcoSmart Designs makes story-carded, recycled, American Made, leadfree pewter pendants. MINIMUM order is 3 pcs per style, $100 minimum. EcoSmart pendants cannot be combined with Light Stones items to meet either minimum.